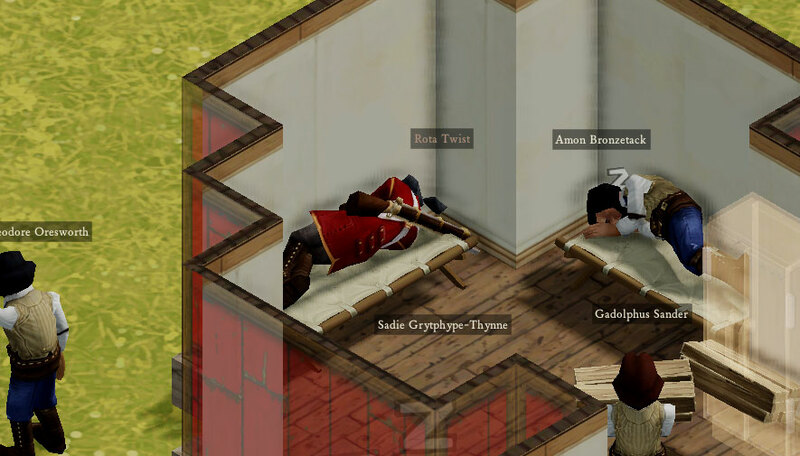 We added a first implementation of barracks to Clockwork Empires in experimental revision 41D (as teased in the last blog post). This is the start of giving the military mechanics more depth, providing the player with more feedback about the status of their squads, and providing the start of a structure to give more control to players over how their military operates. 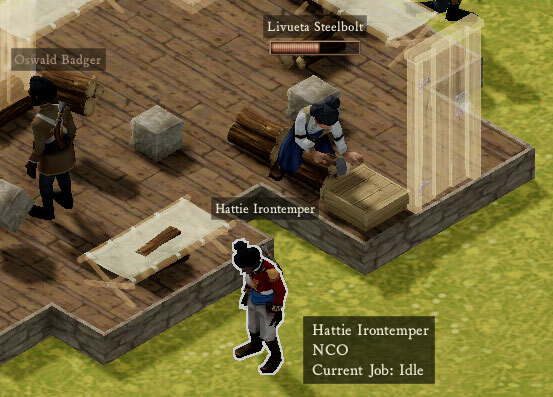 Hattie Irontemper can’t turn Oswald Badget into a proper Redcoat until this barracks is finished. Hurry it up, Livueta! The Barracks act like a workshop (or more precisely, an “office” like the Chapel or Laboratory) which the player may assign a work crew to and by doing so conscript that work crew into the military. The overseer becomes the NCO while any labourers become footsoldiers. 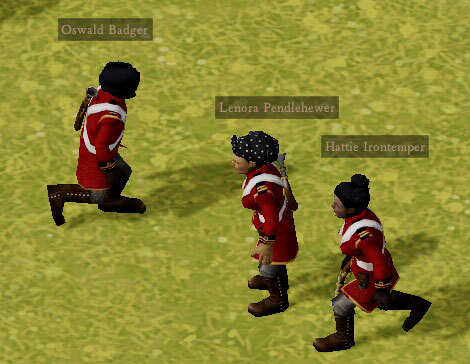 All footsoldiers start as “Militia Footsoldiers”, meaning they reload slower, have a lower morale threshhold for retreating, and deal less damage in combat. The same goes for the NCO if they lack military skill; then they’d become a “Militia NCO” with the same penalties. For the sake of simplicity in this first implementation, training is performed exclusively by doing pushups. 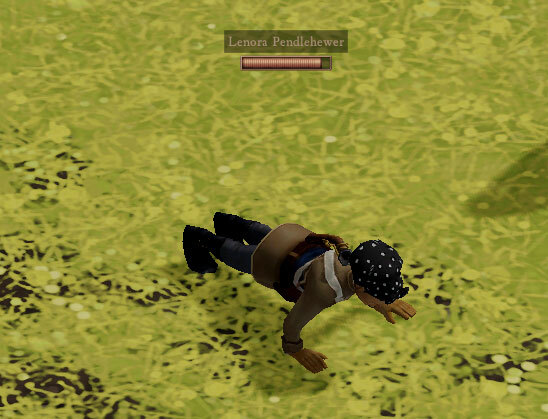 This also uses our fun progress bar system in a new way: rather than measuring the time until a single job completes it measures progress toward becoming a properly-trained Redcoat, and this requires doing many pushups. In gameplay terms this means that if a player wants to create military squads, they need one barracks per squad. As said, there’s an economic hook here so building military requires economy & time investment. Further, proper soldiers require time to train so it puts it in player interest to anticipate and prepare for potential dangers – you can’t simply conscript everyone right-off to fight a unit of roving Stahlmarkians. Well, you can, but they’re unlikely to be as effective. A properly trained squad ready to defend the colony! For Queen & Country! There’s a lot of room for expansion of this system, from additional military behaviours linked to the barracks, to expansion modules altering various qualities of the squad, to using the building UI window as an informational and control point for particular military units standing orders. But the starting place is, of course, making the operation of the new system as clear as possible to players. This involves some new tooltips, ticker notifications, and drawing on all the parallel work going into the new Work Crews interface. We’ve got a few more pushups to go on this one, but it’s getting there. It would be interesting if the Barracks served as an area of ‘influence’. So for example the building creates a patrol radius. This would let the player make little guard outposts in the middle of no where. Little do they know they are an experiment in how quickly people die to REDACTED.